3 Die in Medical Helicopter Crash in Ark. A helicopter ambulance crashed early Tuesday amid the hills of central Arkansas, killing three crew members who were trying to reach a person injured in a traffic accident. The Air Evac Lifeteam helicopter went down near community of Scotland in Van Buren County at around 4 a.m., according to the company and the Federal Aviation Administration. The Bell 206 helicopter, built in 1978, was registered to Air Evac EMS Inc., based in West Plains, Mo., according to the FAA. Air Evac spokeswoman Julie Heavrin said pilot Kenneth Robertson, flight nurse Kenneth Meyer, Jr., and flight paramedic Gayla Gregory all were killed in the crash. The crew was based in Vilonia and had been dispatched to pick up a patient in Crabtree, Ark., reports CBS Affiliate KTHV. Van Buren County Coroner Dorothy Branscum said the victims were killed on impact. "I would say they might have seen it coming, but that was it. The helicopter was just melted and it was just in pieces," Branscum said. The state medical examiner's office will perform the autopsies, she said. The helicopter hit the ground just outside the yard of a home. Less than a mile away, people were camped out for the annual National Championship Chuckwagon Race scheduled for Friday. Investigators from the FAA and the National Transportation Safety Board were traveling to the crash site. "They were flying under (visual flight rules)," said FAA spokesman Lynn Lunsford. "It doesn't appear they were talking to any air traffic controllers at the time." Lunsford said there apparently was no distress call and the cause of the crash wasn't immediately known. Air Evac Lifeteam President and CEO Seth Myers said in a news release that the helicopter was equipped with night vision gear. "This is a tragic day for us here at Air Evac Lifeteam," Myers said. "These were members of our family and we are devastated at this loss. Our focus at this time is on providing support for the family and friends of these crew members." Scotland is about 10 miles southwest of Clinton and some 80 miles north of Little Rock in central Arkansas. 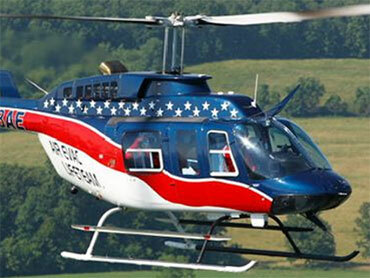 Air Evac has experienced several fatal crashes in recent years, the latest in March when . In 2008, an Air Evac helicopter crashed in an Indiana cornfield killing three people. In 2007, another three-member crew was killed when an Air Evac helicopter crashed in Colbert County, Ala.
Last month, an Air Evac helicopter made a forced landing near Tulsa, Okla., after the aircraft's hydraulics failed. No one was hurt. The company operates in 13 states.